Offering you a complete choice of products which include ultrasonic humidifier and drifog humidifier. Dimensions 36 x 21 x 55 cms (W x D x H). Fog Output 1.50 - 2 Ltrs./Hr. We have gained vast expertise in manufacturing, supplying and exporting better-quality range of Ultrasonic Humidifier that are manufactured using top quality raw materials which are procured from certified vendors in the market. Humidification Capacity 1.5 ~ 2 Ltrs./Hr. 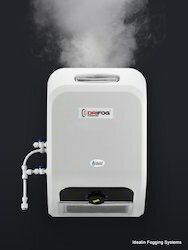 We have gained vast expertise in manufacturing, supplying and exporting better-quality range of Drifog Humidifier that are manufactured using top quality raw materials which are procured from certified vendors in the market. Looking for Ultrasonic Humidifiers ?